I'm of the mind that a little sparkle is never a bad thing. Whether you rock a glittery purple eyeshadow or a glitzy sequined pump, it just adds a little rocker glam to your look. And this season, sparkly shoes have become all the rage! (One of my personal faves -- the Kate Spade Charm, seen above.) Check out even more after the jump. Miu Miu Glittered Crisscross Bootie ($595): Ah, if I only had close to $600 to spend on sparkly shoes ... I've been coveting these strappy sandals for AGES. I'm dying to rock them with skinny leggings and a slouchy tee. 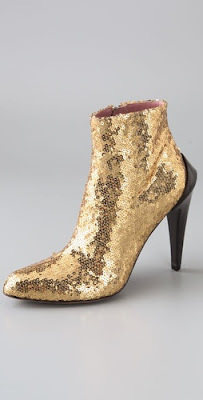 Derek Lam Regine Sequin Booties ($990): These just scream Sergeant Pepper ... but in the coolest, most awesome way. All that's missing is a burgundy velvet jacket. 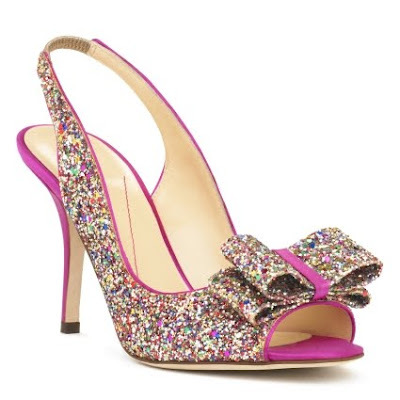 ModCloth Knock Your Socks Off Heel ($134.99): The menswear staple gets a glammed-up touch with rainbow sparkles. I totally love the satin shoelaces, too. 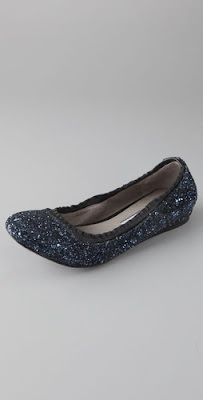 Vera Wang Lavender Label Mariel Glitter Ballet Flats ($225): Because no gal's life is complete without a sparkly pair of flats. 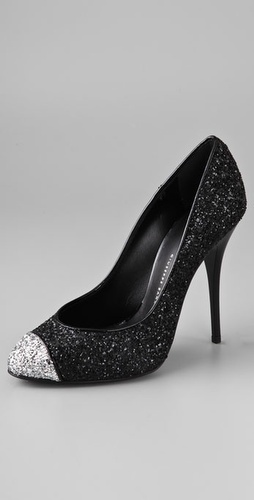 Giuseppe Zanotti Glitter Pumps ($595): A bold mix of black and silver makes a dramatic statement on these sky-high heels.